Low-carb diets such as the Atkin's diet have been a popular way to lose weight. But are they any better or worse than low-fat or calorie-controlled diets? The general premise of high-protein/low-carb diets is that by cutting carbs and increasing protein, you can lose weight faster. Weight loss in the first few days and weeks of a high-protein diet is sometimes faster than with a calorie-controlled diet, but the extra weight loss is primarily due to increased water loss. Studies have shown that after a year, weight loss results are approximately the same on a low-carb diet as they are on a calorie-controlled or low-fat diet. 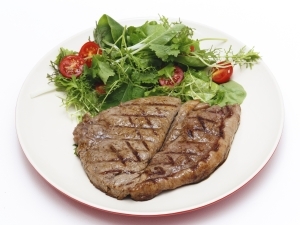 More importantly, high-protein, low-carb diets usually mean you eat much more fat – often more than the recommended daily intake, and often more saturated fat than is healthy. This can increase your risk for heart disease and other health problems. CalorieKing recommends a calorie-controlled diet in which carbohydrates make up around 45 to 65 percent of total calories, fat makes up 20 to 35 percent of total calories, and protein around 10 to 35 percent of total calories. No more than 10 percent of total calories should come from saturated and trans fats. A low-carb diet may work for weight-loss but be inadvisable for weight maintenance. Before considering a low-carb diet, be sure to consider how many carbs you will need to maintain your weight after your weight goal is reached. For advice on your specific needs, consult a doctor or dietitian.